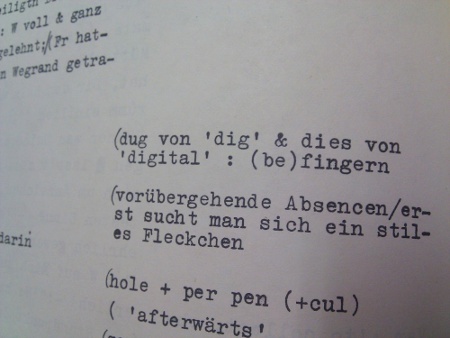 'digital' : to finger sth. Having to do with digits (fingers or toes); performed with a finger. Property of representing values as discrete numbers rather than a continuous spectrum. Of or relating to computers or the Computer Age. Digitus is Latin for finger or toe. To comprehend the reality means literally to grasp, to catch – the same as in German begreifen – to grasp with your fingers. Of the interesting relation between our hands, the comprehending the world and counting, which form also somehow the base of our digital culture, I was reminded by Arno Schmidt’s bawdy derivation of the word digital. When Schmidt was composing his first and most voluminous typescript novel “Zettel’s Traum” end of the 1960s, the word digital in German language had exclusively the anatomical meaning, as given under  in Wiktionary; I looked this up in several German dictionaries and thesauruses of that time period – nowhere would digital be used in the nowadays predominant way  or . In contrary to the English-American sphere. There, digit means a sign for a number after all. Why do the English count directly with their fingers, while we Germans calculate with the Zahl, from zala, which means a mark, a brand sign? Zahl, Zeichen (sign) and digit, as well as toe and token have the same Indo-European root *deik̑-, but the path of the word into the two languages was different however. A problem of interest to astronomers and theologians likewise, from the late antiquity on, was the determination of Easter in the calenders. The difficulty comes from the seven days of the week, the different lengths of the months and the 365 days of the year not being each other’s multiples. Therefore, the first Sunday after the first full moon in spring varies between March 22nd and April 25th. It was the artistry of the Computus to calculate this date for the future years. The anglosaxian Benedictine Beda, the Venerable, is the father of our chronology of AD and BC. Like many thinkers following Augustine, Beda assumed that in our world all things would be “ordered in measure and numbers” (Wisdom 11,20 – sed omnia mensura et numero et pondere disposuisti). To give a calculation for Easter, valid and consistent for the whole world, he had written the henceforth mandatory work on the Computus: De Temporum Ratione, Of the Calculation of the Times. Right the first chapter deals with “Calculation and Language of the Fingers”. Beda introduces counting and shows, how the denumberable, via counting with the fingers, leads to an alphabet of digits; it becomes digitised. “De Computo vel loquela digitorum” – Computing with Digits. Even though many developments of mechanical calculation from Schickard to Leibnitz – and finally Zuse – took place in Germany, it were Charles Babbage and Ada Byron, who put a Digit Counting Apparatus in the mill of their Analytical Engine. Since then, the word digital appears more and more often in context with calculating machines in England and the US. Since the 1930s (and up to today), digital is used to name the coding of signals by discrete values and numbers in opposite to analogue. The digital world – counted with your fingers, abstract, decomposed into data computed under logical rules. In opposite to that is apparently the reality, comprehendalbe in an analogue way. There: Plato – here: Aristotele … etc. etc. Author Joerg BlumtrittPosted on 16/02/2011 16/02/2011 Categories computer science, philosophy, religion, science and mathematicsTags ad, ada lovelace byron, analogue, aristotele, babbage, bc, beda venerabilis, computer, computus, digit, digital, easter, indo-european, Plato1 Comment on >digital<: to finger sth.